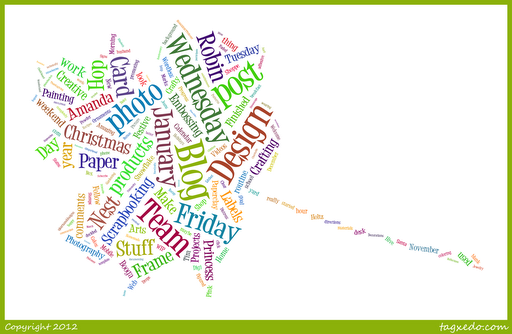 Word Cloud Fun | Who Are You Calling Crafty? This was a free service offered by Tagxedo.com it was really easy you plug in your URL, Twitter, etc and it will create a word cloud for you. I played with a couple of designs before I settled on the leaf and the scrambled look. I thought it was fun and it is really interesting that I say blog and design so much. I hope everyone take a few minutes and creates their own!